The VC Series has a tie barless “C” frame structure to allow obstruction free molding on 3 sides of the clamping area. 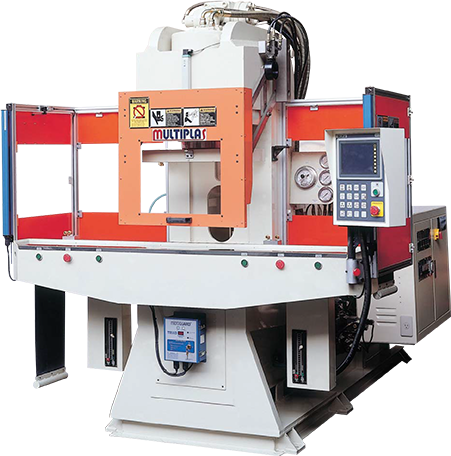 These presses have a vertical clamp with an adjustable horizontal injection unit. These are available as a single station, left/right shuttle or a rotary which makes them highly effective for any insert molding application and /or set up in an automated work cell. Proprotional hydraulics for quick easy set up and repeatable performance. Standard P.L.C. and interface screen by Omron. Complete with hydraulic bottom eject. All pressures, speeds, temperatures and timers set via interface screen. Fully guarded per OSHA requirements. Multiple speeds and pressures for all hydraulic functions.